Sugar and spice are not so nice, at least when it comes to vaping or inhalation. 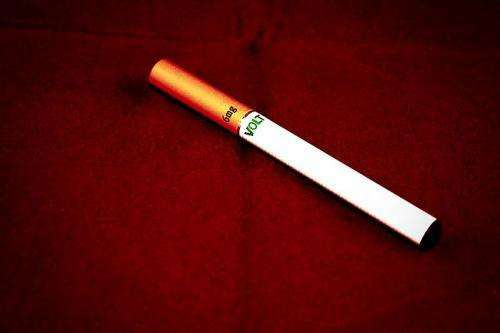 Exposure to e-cigarette flavoring chemicals and liquids can cause significant inflammation to monocytes, a type of white blood cell—and many flavoring compounds are also toxic, with cinnamon, vanilla and buttery flavors among the worst. That's the finding of new research published in open-access journal Frontiers in Physiology, which also found that mixing e-cigarette flavors has a much worse effect than exposure to just one. The study adds to growing evidence on the harmful health effects of e-cigarettes. Vaping exposes the lungs to flavoring chemicals when the e-liquids are heated and inhaled. Since the flavoring chemicals are considered safe to eat, e-cigarettes are often considered—and advertised—as a healthier alternative to traditional cigarettes. However, the health effects of inhaling these chemicals are not well understood. This new study, led by researchers at the University of Rochester Medical Centre in the United States, wanted to test the assumption that vaping nicotine-free flavored e-liquids is safer than smoking conventional cigarettes. Previous studies show that flavors used in e-cigarettes cause inflammatory and oxidative stress responses in lung cells. Users of e-cigarettes also show increased levels oxidative stress markers in the blood compared to non-smokers. The new study extends this to assess the effects of commonly used flavoring chemicals, as well as e-liquids without nicotine, directly on immune cells—namely, a type of white blood cell called monocytes. Exposure to the e-cigarette flavoring chemicals and e-liquids led to higher production of two well-established biomarkers for inflammation and tissue damage mediated by oxidative stress. Furthermore, many of the flavoring chemicals caused significant cell death—with some flavors being more toxic than others.